This coming Saturday, June 20th, from 2PM-5PM at Top of the Hill (corner of Franklin and Columbia St), St As of all stripes will be gathering to mingle and meet. 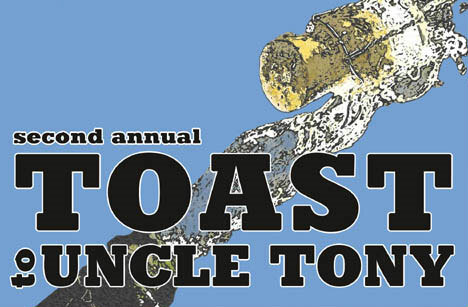 As part of the second annual Toast to Uncle Tony, 13 cities and towns will be hosting get-togethers – if you’re not near one, pick up a glass of your preferred beverage and hoist one sometime on the 20th. Lots of people have helped to get this off the ground this year – in Chapel Hill, the local coordinator is Doug Baldwin X’94 (for the second year in a row!). Nationwide, the youngest pledge class we have participating is 2009. The oldest pledge class we have participating is from 1945. Will you be there? Immediately following the Toast, there will be a Summer Solstice celebration and potluck back at 207 Pittsboro Street. All are welcome to attend! See here for more information. Friday afternoon, after many delays, I wound up on the back porch with KJ. The annex squatted in the back yard, half malevolent ghost angry at its pending exorcism and half empty tortoise shell by the side of the road. An enormous pile of wood and various unidentifiable scraps was heaped in the yard and I thought to myself, Wow, somewhere in there is my old closet. There are two blue lounge chairs on the back deck. KJ had invited me down to the party room to help kill off some of the copious quantities of Diet Cheerwine left from the demolition party so we filled some plastic cups and then, with much trepidation and a little precarious balancing, got into the lounge chairs and kicked back. KJ was waiting for TJ – we are a fraternity fond of initials and nicknames, as we appear to have been in all times – and we passed the time talking about cars and trips and the party. KJ has spent years now working on restoring and cataloguing fraternity documents and she produced a letter sent to the father of a brother from another chapter who had lived at the old Hall for the summer sometime in the 1930’s. The then-treasurer had exhorted the brother’s father to pay the brother’s past-due room and board (some sixteen dollars and change) as, the treasurer explained, the Hall was in a sad financial state and the money would be quite helpful. Things, we agreed, never change. Many thanks to all the sisters and brothers who made Summer Solstice 2008 a tremendous success, especially Bro. Adam Daland and H. Sis. KJ Garner for running the show. There was stunningly good food – homemade cheeseballs, hummus, tomato pie, you name it – and even better fellowship. I was pleasantly shocked to see Bro. Ghirardelli and Bro. Joseph Smith walk through the door. Lying there on the couch in the party room, relaxing after my meal, chatting with SOotH Richard and Bro. Mike Glover, it really came home to me that there is no reason the good times of the Hall have to end with graduation. I really like being on the Board of Directors and working on the Treasury and being involved but it’s so nice to have an evening at the Hall spent relaxing and having fun.